Not every isometric viewed game is inspired by M.C. 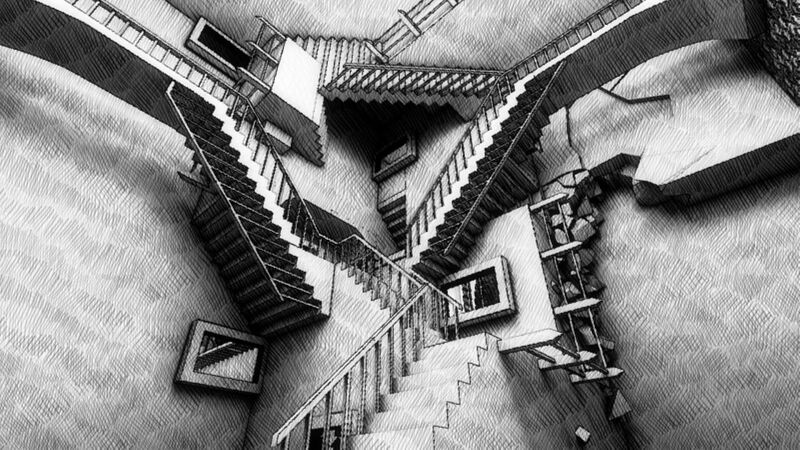 Escher, it takes a little more than that. However, Ustwo’s Monument Valley is definitely one of the games you should look at when looking for modern Escher-like art. When looking at this mobile-only puzzle game, Escher’s most famous artwork Relativity (1953) can be found in the mechanics the game uses. The player-character princess gets to toy around with gravity. You can move herself on top of buildings, stairs and bridges scattered through the various levels to reach the next one. Monument Valley is a great puzzle game on its own makes it a mobile gem for Android and iOS. The game also got a sequel which is currently available for iOS and Android. Sony’s Playstation exclusive puzzle game Echochrome is one that heavily relies on visual perspectives and thereby nods to the art of M.C. Escher. Echochrome is a Lemmings-like puzzle game. Your only tool to direct the game’s character to the end goal is the ability to switch the visual perspective of the level. By doing so, the character can access different paths which it was unable to cross before you changed the perspective. The game even contains a mode in which it lets you create your own levels, which practically makes the amount of options endless. However, unlike Monument Valley, the game doesn’t toy around with gravity, which could have made the game even more Escher-like. Another puzzling game off course. In this one you control the surroundings by turning them in every degrees you can imagine. You play a tiny little man who looks a bit like a scientist. This little man has to walk his way through the levels and eventually finding and unlocking the door to the next puzzle. The art style is brilliant and draws its inspiration heavily from the work of M.C. Escher. However, the game has some annoying difficulty spikes and tends to be a bit slow. On the other hand, a bunch of new levels will open up when you finish the regular ones. And beware, because these are way more difficult than the previous ones. This game needs some love from art-enthusiasts and puzzle game fanatics alike, because it simply deserves it. Back to Bed is a short puzzle game in which you have to direct the sleepwalking Bob back to bed. The game plays out in the same way as for instance Sega’s Chu Chu Rocket, but this time you will teleport between areas and defy gravity by walking on walls. The video game is kinda average, but its great art style is the main selling point. Back to Bed combines an isometric Escher perspective with some fancy Dali art and it works brilliantly. It makes the game a little above average. Because it lasts only little more than an hour, it’s the perfect game to play in between the big guys. Though Q*bert isn’t the first game to apply an isometric perspective, it is one of the earliest and most popular uses of this viewpoint. Q*bert however doesn’t toy with gravity as a character itself, but some of his enemy characters do. When playing the classic Gottlieb arcade game, you have to watch out that the cuddly Q*bert doesn’t get caught by enemies from both sides of the perspectives. While trying to color all the tiles of the playing field by jumping on them. Like a proper arcade game, Q*bert gets more difficult while you progress and you will get more aggressive and creative enemies. Let’s hope Q*bert will restore its status by starring in a new stellar game. Bacause it would be a shame if being a cheap cameo in various Hollywood projects would be the way to remember this little guy. Fragments of Euclid might not be a full-fledged game. On the other hand it’s probably the closest you can get when it comes to walking inside a work of M.C. Escher. You play this game from a first person perspective, which makes the player really feel part of a work of art. As if you are walking in the ‘Relativity’ painting itself. Although the video game is only 45 minutes short and thereby not a full experience. It proves that video games are the best art form to actually experience this sort of art in real life. You can even play it yourself, by downloading it for free here . This video game is even named after Escher’s most well-known piece of art ‘Relativity’ during its development period. Although it isn’t out yet, it looks promising. In this first person platformer Manifold Garden, you need to maneuver yourself around the levels by constantly changing gravity. The goal is to get certain blocks from one side of the level to the other. However, when you change the gravity, the floor’s colors change as well. The blocks can only be moved when the floor’s color is corresponding. The game looks a little rough on the edges, but the puzzling seems to be fine. Hopefully 2018 will be a good year for this game.